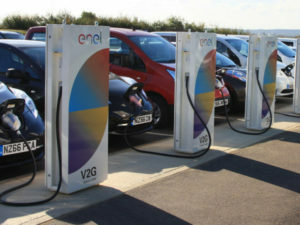 Future high-renewable energy systems in the UK and Germany will require more flexible solutions – including smart charging and vehicle-to-grid infrastructures – to help ensure power continuity. That’s the finding of a new report from Bloomberg New Energy Finance, commissioned by Eaton in partnership with the REA, which looks at economic tipping points relating to renewable power production and the need for greater electricity system flexibility in the future. According to the report, economic tipping points mean renewable energy will account for over half of electricity generation by the mid-2020s in the UK and Germany. This comes as the cost of generating energy from wind and solar is expected to more than halve from today’s levels, by 2040. However, the report says that such massive increases in renewable energy generation mean that we must start planning now for how to manage seasonal gaps with economic, low carbon solutions when there is not enough wind and solar power to meet peak demand. It adds that in this environment, flexible power technologies such as energy storage and gas generators will have an advantage. In addition, certain types of demand response such as flexible electric vehicle charging and variable industrial loads can respond quickly to conditions on the grid, or shift or consume surplus renewable energy. “This study highlights a seismic shift in how power systems will operate in future. As wind and solar become the cheapest options for power generation, the race is on to develop and deploy the flexible resources that will complement them,” added Albert Cheung, head of global analysis at Bloomberg New Energy Finance.